This weekend’s Upcountry Sundays Acoustic Style benefit for Mana’o Radio at Casanova in Makawao features three female singer/songwriters that share the ability to write powerful songs and present them in a friendly accessible manner. The women, Gail Swanson, Sebrina Barron and Elaine Ryan, also share a love for one of the most cutting edge, independent singer/songwriters of this generation, Ani DiFranco. Elaine Ryan, who came to Maui from Vancouver, Canada, said she picked up a guitar as a teen after seeing DiFranco perform in a tiny venue in Galway, Ireland, according to her website. Elaine said she found inspiration through DiFranco’s strong lyrics and captivating presence. In her bio, Elaine talks about her passion for social justice, her experiences that range from working in a Guatemalan orphanage to busking her way through Switzerland and Spain, and the surprising amount of musical talent on the island. What a treat it will be to see her on the same bill as one of Maui’s brightest stars, Gail Swanson. I first met Gail several years ago when she was playing weekly gigs at Cheeseburger in Paradise in Lahaina. We had mutual friends in California, which is what initially brought me to her shows. However, it was our mutual love of Ani DiFranco that made me realize that Gail was far more than a woman with a guitar singing cover tunes in a local pub. “That is so sweet of you,” Gail responded. “Who is your favorite singer/songwriter?” she asked. And before I could finish saying “Ani Di …,” Gail interrupted. “I LOVE Ani DiFranco,” she said, and our friendship began. Gail recently released a new CD, “Simple Truth,” which reveals what I realized that day years ago; she is far more than someone singing covers in a bar. She is a wonderful songwriter who manages to make everyone attending her concerts feel special with her friendly stage presence, charming showmanship and joyful music. Though most of the songs on her new CD are originals, Gail has not completely abandoned playing cover tunes. During her weekly Friday-evening gig at Mulligan’s on the Blue in Wailea, she takes requests ranging from Bob Dylan and the Beatles to Sheryl Crow and Colbie Caillet. However, it will be a real treat for listeners this Sunday at Casanova, where Gail will share much of her original music from her new CD. In addition to shining on her own, Gail has the support of several high-profile performers including Willie Nelson, who sings two duets on her new release. Plus, her CD release party at Mulligan’s in February has already gone down in history as one of the best gigs of the year with appearances by current and past Doobie Brothers Pat Simmons and Michael McDonald, Hawaii’s award-winning John Cruz and an all-star band of players. Just as Gail’s musical friends lend her support, she does the same for younger musicians. She recently called 18-year-old Sebrina Barron to the stage at Mulligan’s to play a few songs. Gail, who has long recognized Sebrina’s talent, hadn’t heard her perform in a while and was blown away by how much Sebrina had grown as both a performer and songwriter. 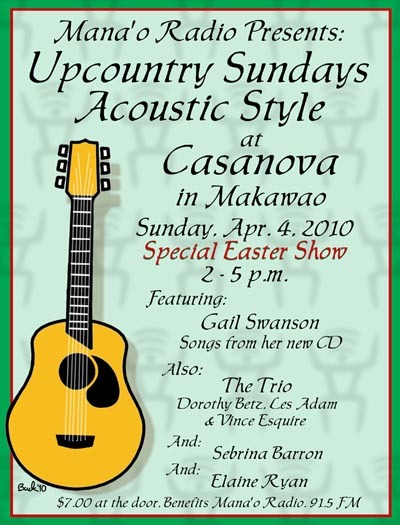 The same can be said for the line-up at the special Easter edition of Upcountry Sundays April 4 at Casanova in Makawao. In addition to the three wonderful singer/songwriters mentioned, Mana’o Radio’s regular monthly benefit show will feature The Trio, a dynamic and versatile group featuring Dorothy Betz, Les Adam and Vince Esquire. Between the three of them, they bring a mass amount of talent to the stage and never disappoint. Since this Sunday is Easter, the wonderful people at Mana’o will be hiding Easter Eggs with goodies inside all over the restaurant. One of the eggs will contain a Grand Prize–free admission for two to any Upcountry Sundays show. But just as I like to support my favorite singer/songwriters by spending money on their art, I encourage everyone to drop a measly $7 at the door–at this show and future Mana’o benefits–to help support Maui’s only listener-supported free-form radio station. The concert starts at 2:00 pm. and wraps at 5:00. However, Casanova will welcome Maui’s own Jaxon Chester to the stage as the restaurant transitions from afternoon to evening. Jaxon is an 8-year-old music fanatic who plays ukulele and writes original music. During his young life, he has received kudos from the likes Aerosmith’s Steven Tyler, ukulele virtuoso Jake Shimabukuro and guitarist/ukulele aficionado Vince Esquire. For those not fortunate to live on the island, you can hear the entire Upcountry Sundays Acoustic Style concert on the internet at the Mana’o Radio website. The show also will be broadcast on Mana’o Radio, 91.5 FM.